Defined by imposing neoclassical monuments and buildings, including the most iconic ones that house the three pillars of our government, Washington, DC is not only the center of action and power, but the perfect weekend getaway to take in some of our nation’s finest attractions. Just a three hour train ride from New York City, DC offers a beautiful change of scenery and a call to take in some history and appreciate another stimulating city filled with remarkable museums, restaurants, and hotels. One such hotel, The Carlyle Dupont Circle, a Kimpton Hotel, places you in perfect proximity to all the bustle, close enough to the action, yet equally distant to be a quiet respite from the outside world. 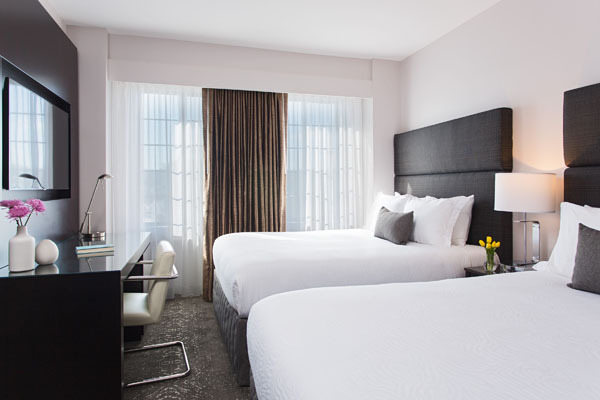 Just a short stroll from popular attractions like George Washington University, White House, and Smithsonian’s National Zoo, this newly redesigned Art Deco boutique hotel is the optimum fusion of modernity and sophistication. 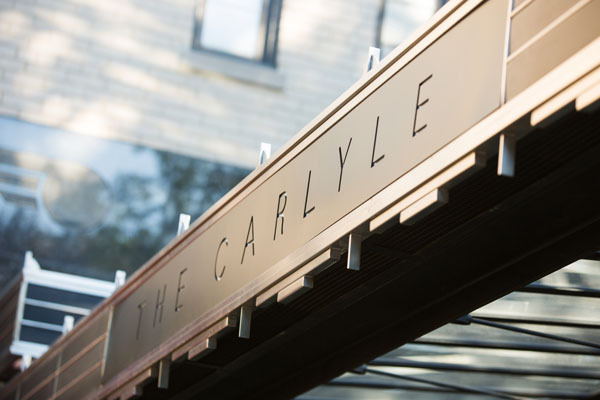 Situated on a beautiful tree-lined street, The Carlyle stands as a charming and inviting hotel. The facade maintains a residential quality, however, upon entering, the space opens up into a modern oasis accented with Art Deco details. The glamorous lobby, foyer, and hallways are reminiscent of 1930s Hollywood, while the 198 rooms are comfortable and adorned in elegant shades of grey and blue with geometric accents. The vibrant art and carefully chosen decor and furniture complement the spacious and well-laid-out rooms, complete with all the amenities of a top-notch hotel. Comfort and luxury blend together with Temper-pedic beds fit with fine Frette linens, ensuring a good night’s rest. The state-of-the-art full service kitchens, available in most rooms, are a cozy addition for those who want to feel right at home. 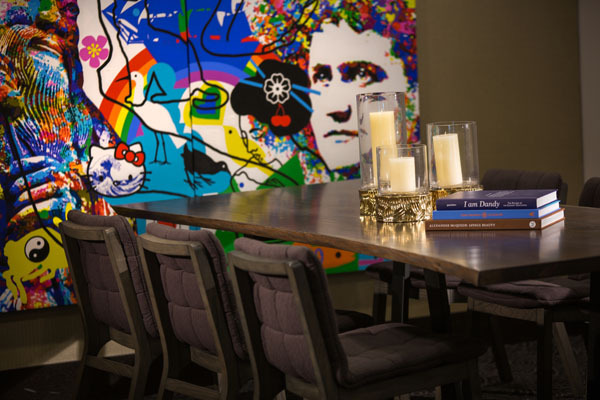 Gourmands must be sure to reserve a table at the in-house restaurant, The Riggsby, where Chef Michael Schlow serves upscale American cuisine with distinctly European influences. Styled after a retro American supper club with classic leather booths and oak panels, the Riggsby maintains a retro vibe yet also intimate and elegant, featuring delectable plates which make for a convenient yet memorable evening. The Carlyle is not only at one of the most coveted addresses in trendy and historic Dupont, but provides excellent service and great amenities. The neighborhood’s magnetic energy invites residents and tourists alike to observe and participate in its many activities – from browsing trendy shops, roaming along flag-lined Embassy Row, taking in the art at one of the myriad of galleries and historic houses, to having a creative cocktail in some of the city’s hippest spots. Regardless, you will be glad to make The Carlyle Dupont Circle your base from which to explore.